The Munson was a Belleville based steam powered dredge. In the year 1890 it was being towed back to Belleville after completing a job in Kingston by the Emma Munson. About a mile southeast of Collins Bay the vessel started to take on water and sank just off Lemoines Point. It sits upright in 112 feet of water. It’s large shovel lays to the north, the electric generator that is home to a ling cod, is still mounted on the upper deck. A steam boiler, steam engine, plus the many other artifacts still present make this wreck a worthwhile dive. It is intact with the exception of the cabin siding which has fallen off. 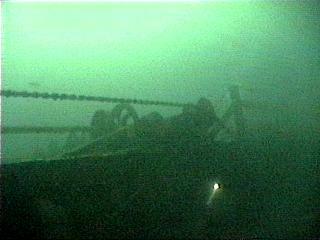 The wreck is marked with a mooring bouy supplied by P.O.W. Ready to book, have questions or need to get in touch? © 2019 Pat’s Dive Charters. Made with ♥ by Think Up!.